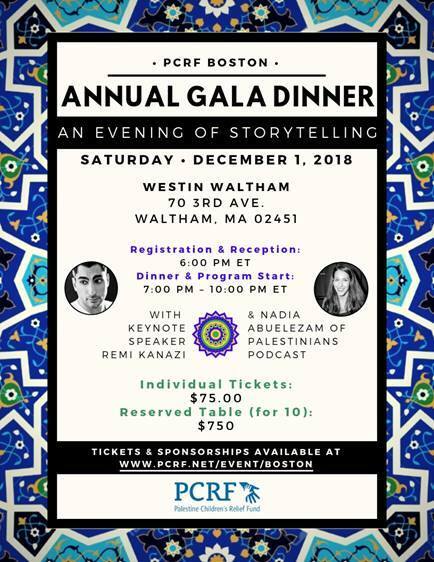 Please join us, on December 1st, for what promises to be a great evening celebrating Palestinian stories and fundraising for the Palestine Children’s Relief Fund (PCRF) to benefit the humanitarian projects of the PCRF. This year’s fundraiser will feature unique stories highlighting the wonderful spirit and resilience of Palestinians. Our keynote speaker this year will be the one and only Palestinian poet and spoken word artist Remi Kanazi! The evening will also feature special guest Nadia Abuelezam of Palestinians Podcast. Don’t wait to buy your tickets, the last two PCRF-Boston fundraising events SOLD OUT before the event. We look forward to seeing you on December 1st and thank you for your continued support.